Below-Deck Technology with Moeller's Above-&-Beyond Innovation. 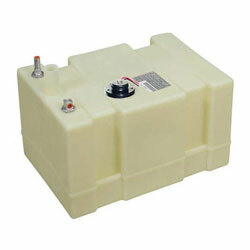 Unlike aluminum tanks, this comprehensive line of cross-linked polyethylene models is a distinctive Moeller innovation. Helping you properly secure your tank, convenient hold down grooves molded directly into tank shell work great with Moeller's Permanent Fuel Tank Hold Down Kit (035710-10 / 07147).